How many times have you promised yourself you were going to be there? Feeling the rush… Hearing the crowds cheer… Being one of the brave runners in red and white maneuvering their way around the bulls? How many times were you ready to tick that item off your bucket list and, somehow, life got in the way? Too many. But this is it! You are off to Pamplona! AND YOU ARE GOING TO RUN EL ENCIERRO! What a wonderful story to tell your friends back home, right? But now, something it’s telling you that sharing the pavement with these animals could be… too close for comfort? Are you getting cold feet about running with the bulls? Rent a balcony in Pamplona instead! What a concept! Renting out a balcony? Just the balcony? The balcony is the focal point of the event, but when you rent out a balcony, you are, in fact, sharing a once-in-a-life-time experience with expert guides who know the event and, in many cases, have run it themselves! And all, from a controlled and safe environment. And with a full stomach! Because, when you rent a balcony in Pamplona from us, you will also be sharing a breakfast spread of local produce which, we know you are going to love! Have you decided to run and want your family and friends to have the best possible view? Don’t forget to talk to us about our “Learning how to run tours”! 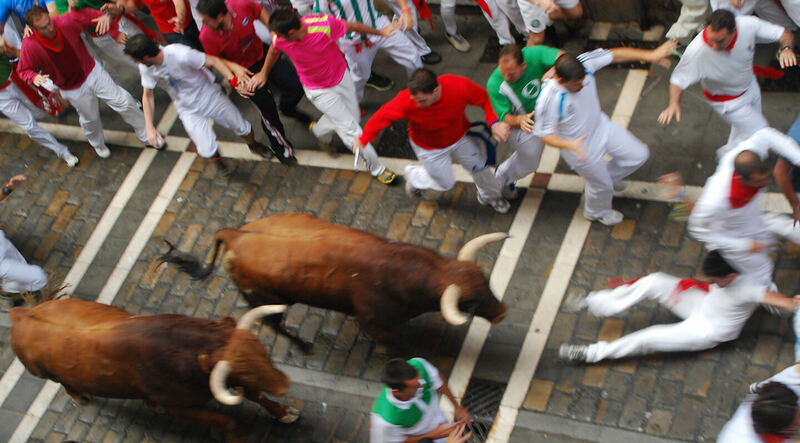 While running with the bulls in Pamplona is a wonderful and memorable experience for most people, understanding the event, getting to know the intricacies of the itinerary and learning how to move in front of the animals can help minimize potential risks. And, now that you are running, your family and friends need to have the best possible vantage point to record your run for posterity! And for you to see it over and over again. Yes, it’s ok to admit it! Not everyone is willing nor capable to achieve such an extraordinary feat! Are you worried about renting a balcony online? Understandably so. Sadly, there are far too many scams and far too many disappointments. And sadly, the beautiful city of Pamplona and its internationally renowned century-old festival sees its name tarnished as a result of the actions of a few undesirables. But with Pamplona Fiesta, you can rest assured that your expectations will always be met. In fact, you’ll probably be surprised by how far we are prepared to go to make you feel safe and happy, and to have you back with us! If you want to see the Running of the Bulls, this is the place you want to be! Before booking, I had read horror stories on the web about those “services” that rent people’s balconies out – no one opening the door, people missing the entire event, being disgusting inside, etc. Francisco’s place could not have been more different. First, Francisco gave VERY clear instructions about where to go and how to get to his place. When I showed up, he recognized me instantly and led me and the two people with me upstairs. There he had some juice, snacks, water, etc. for us and an amazing view of Plaza Castillo. Next he led us down to our private balcony (it was only the three of us on our balcony during the run). It was perfect. He took time to explain to us what was going to happen, what we should watch for, and how to enjoy the experience the most. Afterwards we all went back upstairs and watched the full run in replay on a big screen television. Francisco never rushed us and allowed us to stay as long as we wanted, hanging out and taking pictures. I can’t say enough good things about Francisco, his space and his hospitality. If you have an opportunity to see the Running of the Bulls, do yourself a favor and watch from one of Francisco’s balconies. Why rent your balcony from Pamplona Fiesta? We have a large number of balconies available ideally located in strategic vantage points of the itinerary. 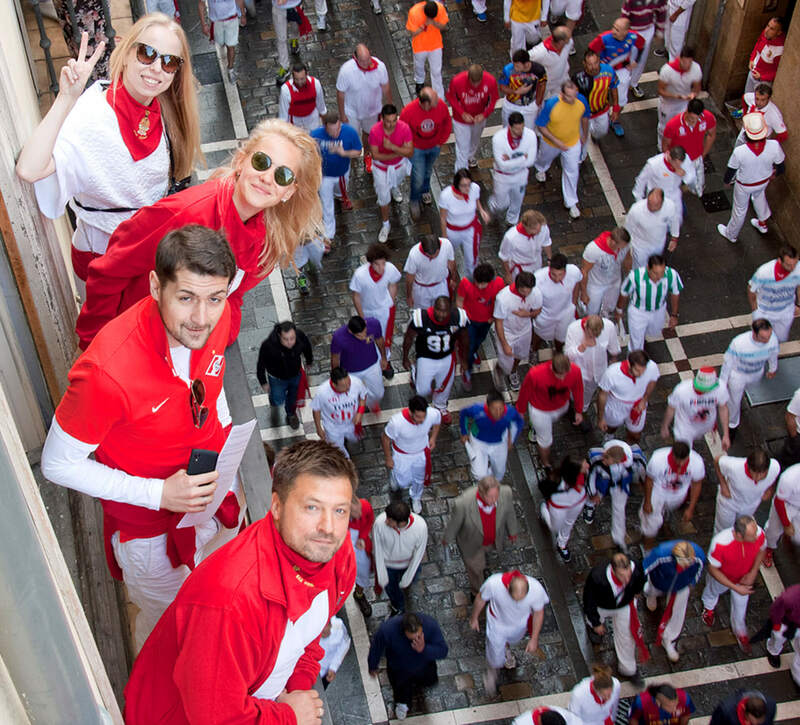 We are locals (or expats who have lived in Pamplona for more than 15 years) with an extensive knowledge of the bull run tradition and history, having ran El Encierro many times ourselves. Our apartments are modern, well-presented and extremely clean. You’ll receive a delicious Spanish-style breakfast spread before 8 am. You will not feel rushed at any point during this experience and will be able to take as many photographs and/or videos as you’d like (however, please note that you will not be able to use your tripod as there’s not enough space for everyone’s photographic equipment in the balconies). We will replay the event after it’s finished on a large screen TV and comment on it. Our priority is to ensure you and your family and friends live a memorable experience and understand that the only possible way to achieve this is by maintaining an excellent level of communication at all times. We offer secure online payment facilities. So, now that you are finally about to tick that item off your bucket list: Make sure you minimize all potential risks, plan your participation in this incomparable event properly so you can enjoy it to the max and record it from the best possible vantage point. Because the whole world needs to know you have run with the bulls in Pamplona!